The 89-DP-S7300 PLC Profibus Learning System adds to the 890-PEC-B and 890-S7300 Troubleshooting Learning Systems to teach industrial communication networks and data exchange using the Profibus-DP network. Profibus is a high-speed industrial network for use with Siemens PLC’s. The Profibus learning system network provides real time control required by automated production lines and process control systems as well as providing services necessary to communicate with other departments within the manufacturing facility. 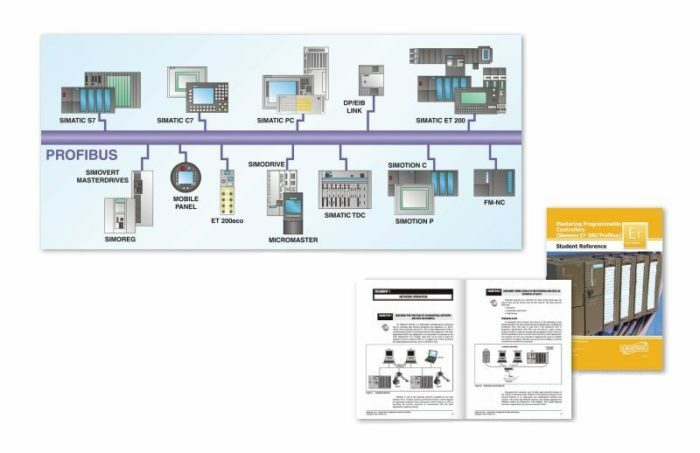 Manufacturing technicians will need to understand these networks and their operation in order to install and troubleshoot the networks as well as the network’s interconnections to PLC’s. The 89-DP-S7300 includes: communications processor PCI card, SIMATIC NET software, cables, supplemental disk, student curriculum for both theory and lab, and teacher’s assessment guide.